Word association might still link Ginetta to petite sports cars like the classic G4 and the modern-day G40, but these days the Leeds marque is just as much a maker of cutting-edge sports prototypes as entry-level sports coupes. In 2018 it becomes a full-blown Le Mans car manufacturer, with plans to supply up to 10 cars to teams in the top LMP1 class in the World Endurance Championship (WEC) and its 24 Hour centrepiece. The LMP1 car is still in development, and it’s being created using many of the lessons learned in this car – the very fast, and alluringly threatening-looking G57-P2. 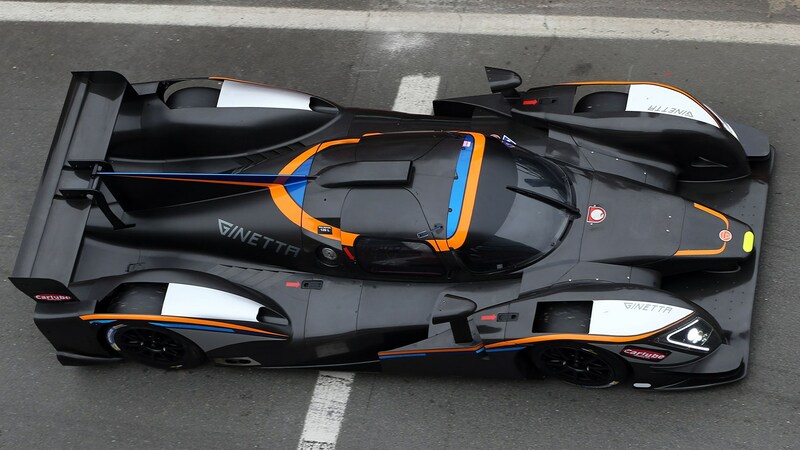 What exactly is the Ginetta G57-P2? 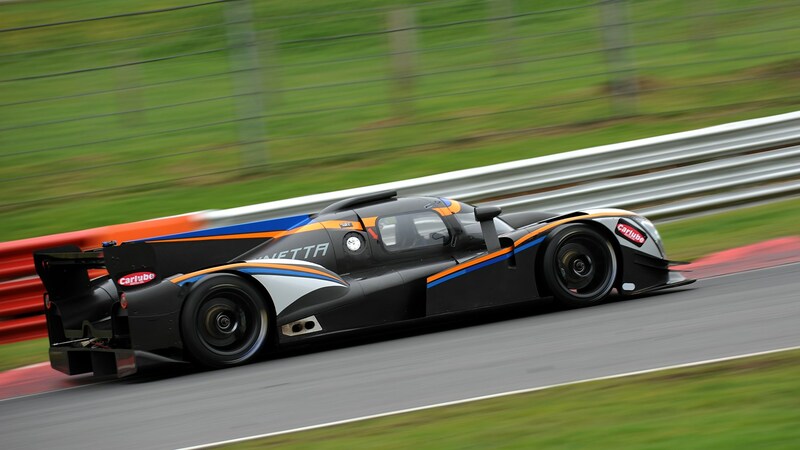 Launched for the 2016 season, it’s an evolution of Ginetta’s LMP3 racing car, in which Sir Chris Hoy and teammate Charlie Robertson won the inaugural LMP3 prototype championship in 2015. 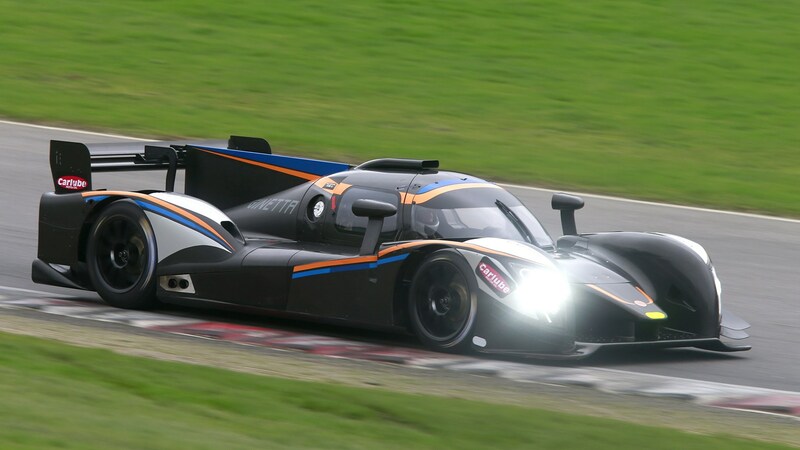 Compared with the LMP3 car it summons greater power and downforce, and as its name suggests, it is capable of pace comparable to the tier-two LMP2 class at Le Mans. ‘This car was always planned at the start of the prototype project,’ the G57-P2’s lead designer Peter Smith told CAR. ‘Compared with the LMP3 car, it has increased downforce with a different floor and dual-element rear wing, a different engine with more power and an increased cooling package and uprated gearbox to go with it, and a new Motec electronics system. Where can I race it? Although the G57-P2 isn’t eligible to race at Le Mans, it’s competitive in a variety of sportscar championships around the world, including Creventic 24hr prototype series, Dutch Supercar Superlights, Britcar proto series and the European V de V series, in which it won the 2016 overall championship with Ginetta boss Lawrence Tomlinson at the wheel alongside Mike Simpson. It’s becoming eligible for further series in the near future as regulations continue to adapt. It is. With its rear bodywork removed in the Brands Hatch pits exposing its carbon respiratory system, gold heat reflector surfaces and bunch-o’-snakes exhaust system coiled ahead of its pushrod suspension, it’s a Proper Bit Of Kit, and not a little intimidating. 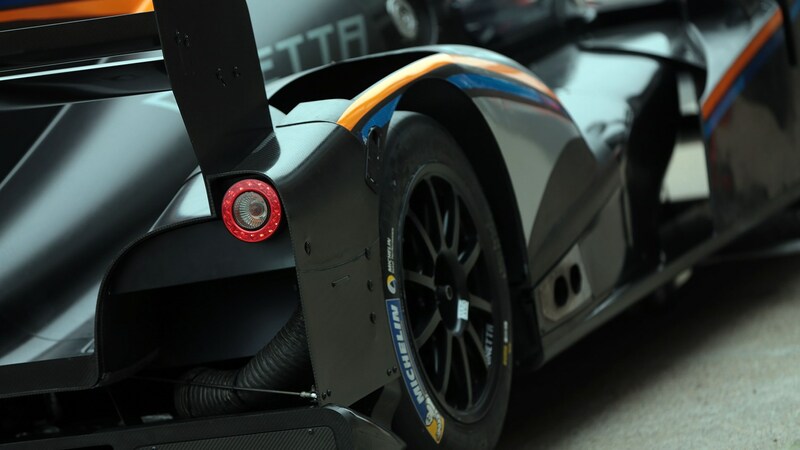 The G57’s carbonfibre monocoque chassis is built in-house by Ginetta, and the carbon bodywork’s aerodynamics were developed through a combination of CFD and wind tunnel work at a major motorsport facility in Europe. Smith says the G57 can corner at close to 3g. The upcoming LMP1 car will spend an even greater number of hours in the wind tunnel, and generate even greater downforce. Works Ginetta driver Mike Simpson’s already been out on track to check the car over, streaking past GT4 cars like they’re standing still and sending showers of sparks into the air like an ’80s F1 car. Watching from the pitwall, the G57-P2’s rumbling V8 soundtrack sounds eerily quiet compared with the cars around it, despite its enormous speed advantage. ‘Stay high on the main straight to avoid the bumps, and brake with your right foot so you can brace yourself with your left,’ Mike tells me when he returns. ‘In endurance races I right-foot brake in this car, as it saves fuel compared with using both feet on the pedals. It can actually gain you a fuel stop in a long race. Don’t use any kerb at all, remember to hit the brakes hard, and enjoy it – it’s just a car, go and drive it!’ Right you are then. Flip the forward-hinged door upward, post yourself through the opening and you’ll find yourself sat inside the G57’s carbon tub with a steel roll structure above you. Ahead, there’s a fantastic view out of the domed screen, bookended by the twin bulges of the front wheelarches. Without a moulded seat, I’m sat on a malleable bag of foam beads, in a low, reclined driving position. 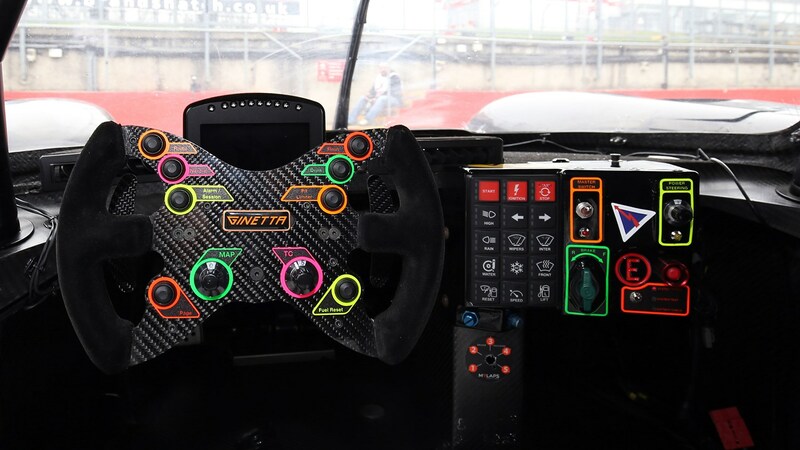 My hands grip a carbonfibre steering wheel of Ginetta’s own design, with rapid-prototyped hand-grips and peppered with switchgear, colour-coded with UV-sensitive glow-in-the-dark graphics for night racing. Very fast! But also surprisingly user-friendly. Toe-poke the clutch to avoid catching the top of your boot on the anti-roll bar, pile on a few revs to pull away and the cockpit fills with the whine of straight-cut gears, over a bed of snorting, snarling V8. Once you’re underway, the clutch pedal becomes redundant and the wheel-mounted paddles are all you need to shift gears. A gentle increase in pressure on the throttle pedal exiting the pitlane and already the G57 feels absurdly fast. With more than 440lb ft spread over such a wide torque band, the speed piles on quickly, whichever gear you’re in. The shift-lights on the digital instrument cluster don’t turn red until 7000rpm, but somehow you always feel as if you’re short-shifting, such is the breadth of the torque curve. Squeezing the brakes for the first big stop into Druids and there’s slightly less feedback through the light-feeling pedal than you might expect. There’s no ABS, of course, and it can be difficult to tell when a front tyre is on the point of locking until you’ve fully tuned yourself into the brakes’ feel. No doubting their stopping power though. The amount of feedback through the steering can be tuned by the driver, with a rotary dial on the dash to turn the level of power steering assistance up or down – vital to prevent fatigue in long-distance endurance races. Likewise, there’s a dial on the wheel to turn the traction control system up or down (or off completely). It’s hugely confidence inspiring: you can lean on the system hard out of Graham Hill Bend and Clearways, safe in the knowledge that if you get on the power too early the electronic leash will rein the V8 in and keep the tail in line. It’s not the same as stability control – you could still spin the car under momentum – but it’s a valuable aid, and one I’m grateful for as I get to know the car for the first time. Turn the steering and there’s instant grip and response from the front tyres, and at higher speeds you can feel the aero get to work and paint the car into the tarmac. The speed you can carry through Paddock Hill Bend is as uncanny as it is addictive. Not something I’ll forget in a hurry. I’d expected the G57-P2 to feel constricted around the compact Brands Hatch Indy circuit – like riding a MotoGP bike around a minimoto track – but it’s as tractable and friendly to drive as it is exhilarating, in-keeping with its design remit to be equally suited to a gentleman driver getting their first taste of high-level endurance racing as it is to a pro like Simpson. The view through the domed screen is one that will stay with me for some time; next year the faster-still Ginetta LMP1 car will see the Mulsanne Straight devoured through it. Bonne chance, boys!